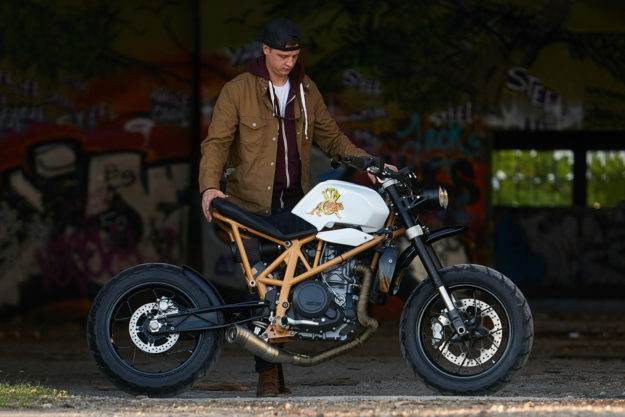 The modern custom scene was built on a sturdy foundation of cafe racers, bobbers and trackers. But there’s a new wave emerging—modern customs that eschew tried and tested formulas. 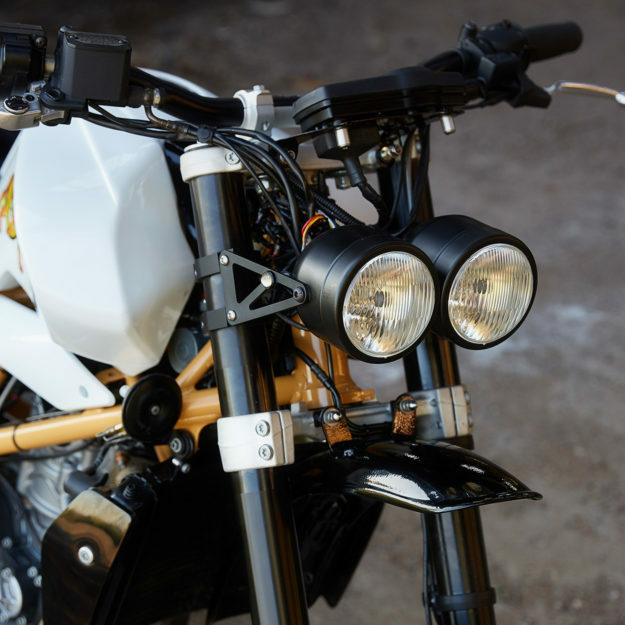 It’s led by workshops like Classified Moto and Ad Hoc Cafe Racers. 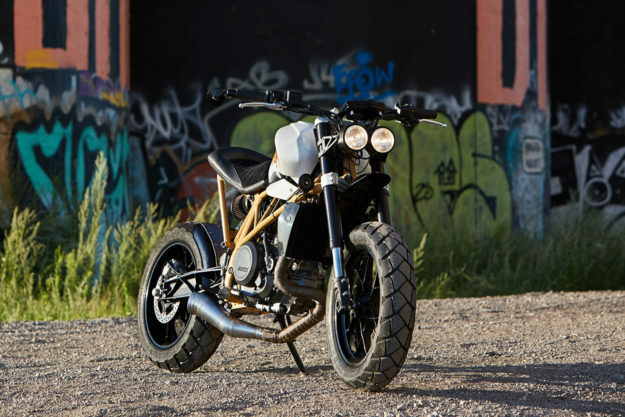 And now Federal Moto US have thrown their hat in the ring, with this ballsy re-interpretation of the KTM 690 Duke. 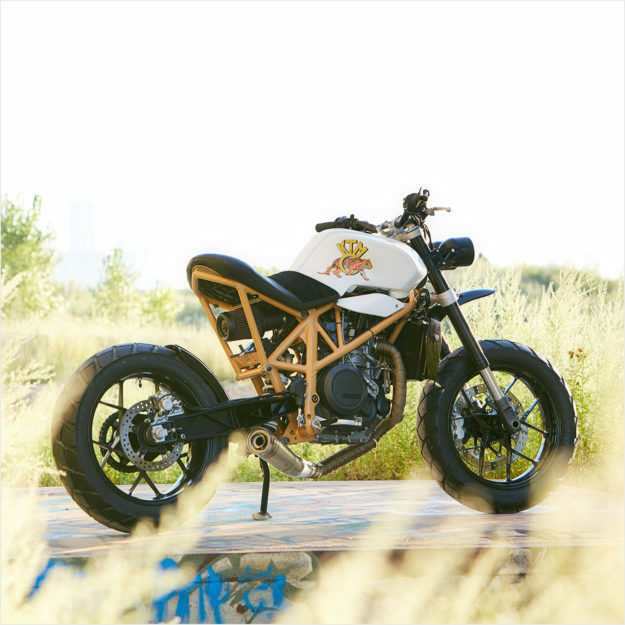 Brothers Mike and Peter Müller of Federal’s Chicago outpost weren’t aiming for a particular style when they tore into the 2013-model Duke. Instead, they set out to trim it down drastically. “The goal was to eliminate as much of the bulk—and plastic—as possible,” explains Federal director, Shaun Brandt, from his HQ in Canada. 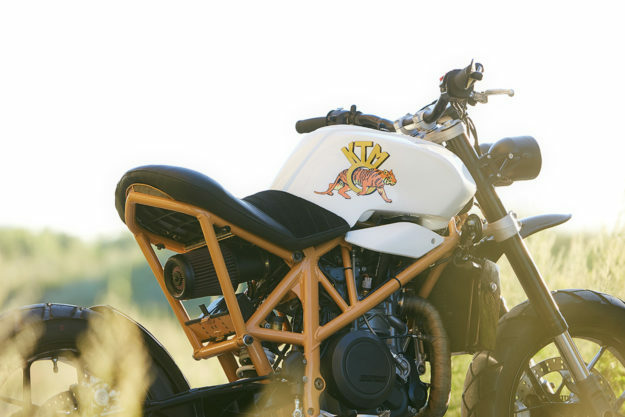 The Müller brothers ruthlessly removed the Duke’s plastics, subframe and anything else they could do without. Ditching the stock air intake system helped shed a fair bit of bulk. In its place, they installed a K&N filter to improve intake airflow, and a ‘Smart Moto’ SAS valve plate kit to improve exhaust flow. 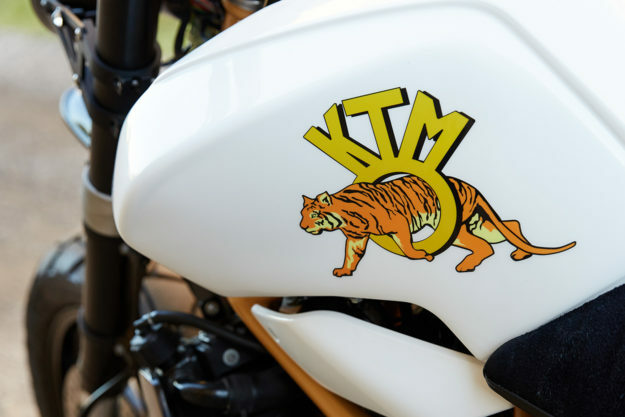 The KTM’s original fuel tank stayed behind. But without the stock shrouds, it was left full of mounting holes. So Federal set about the arduous task of filling and smoothing it all out. 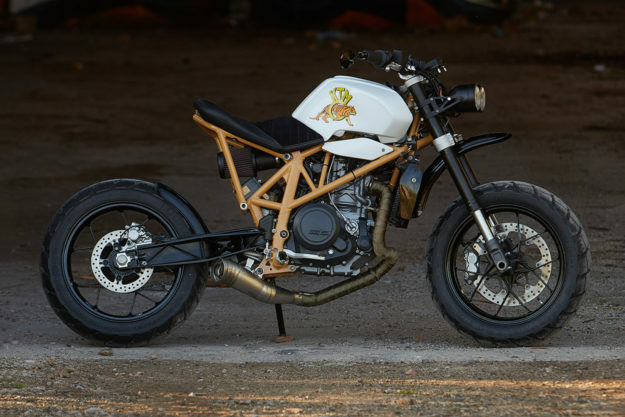 Out back is a custom-made subframe and seat, designed to be kicked-up and as short as possible. The seat upholstery is particularly neat, done with a mix of leather and suede. Hiding underneath is a svelte Lithium-ion battery from Antigravity. 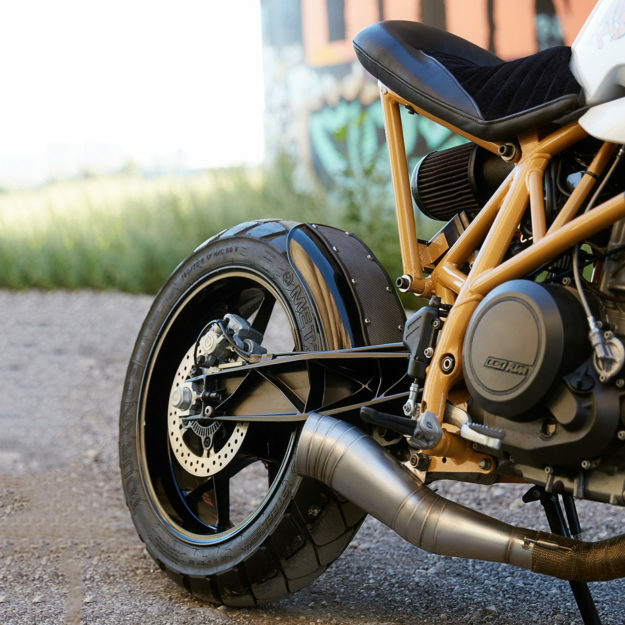 The 690 Duke is phenomenal fun on the road, so Federal wisely left items like the suspension, brakes and wheels alone. They simply fitted new Metzeler Tourance rubber, giving the bike excellent asphalt grip with the ability to handle light dirt duties. Upgrades include Renthal fat bars, Biltwell Inc. Renegade grips and a custom exhaust system with a titanium wrap. The standard gauges have been repositioned with a one-off mount, and the headlight’s been replaced with dual lamps on custom brackets. 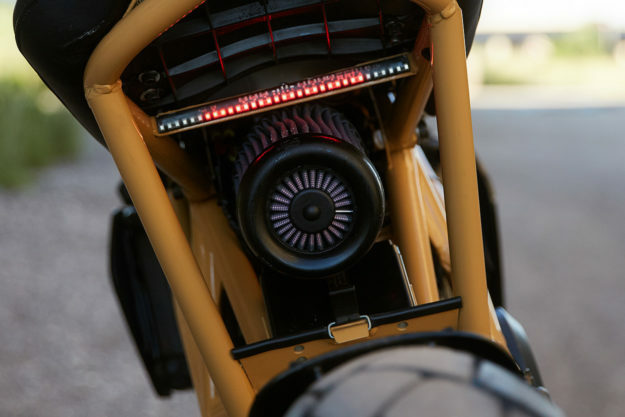 Strategically-placed LEDs handle tail light and turn signal duties. And daily riders can rejoice: Federal even fitted fenders at both ends. When it was time to paint, Federal picked a super-classy scheme: white, with a paler orange for the frame than we see on modern KTMs. But something was missing. “It was easy: the rear end sits high, tight, and extra short, like Daisy Duke’s cutoff jean shorts,” quips Shaun. Just like the Dukes of Hazzard, Federal’s KTM is loud and reckless. And hopefully a sign of things to come.